This article describes Managed Beans in JSF. 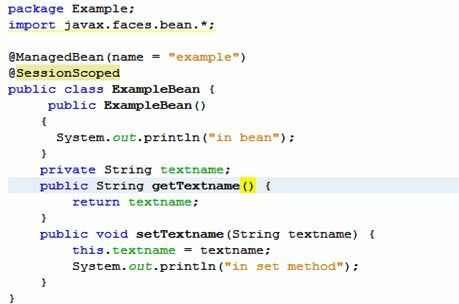 A Managed Bean is a Java class file to which components of JSF pages are mapped. 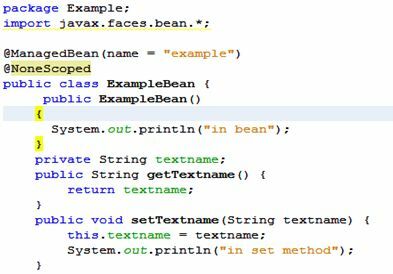 A Managed Bean is a Java class file to which components of JSF pages are mapped. A JSF application has one or more Managed Beans that handle the business logic or a backing Bean for the values of components displayed on the JSF page. Normally, a Managed Bean has getter and setter methods of the properties mapped as the component's value on JSF pages. Handle an event fired by component on UI page. Let's take a simple example to better understand the scope of Managed Beans. I have created an index.xhtml file with a TextBox and a submit button. 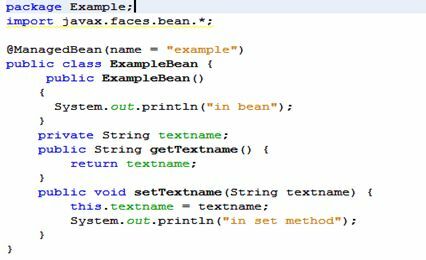 The TextBox field value is mapped to the Bean property textname using the expression language. An action to call an output.xhtml page on the click event is defined on the command button. The Output.xhtml file displays the value of the Bean property textname (in other words the value entered into the TextBox). 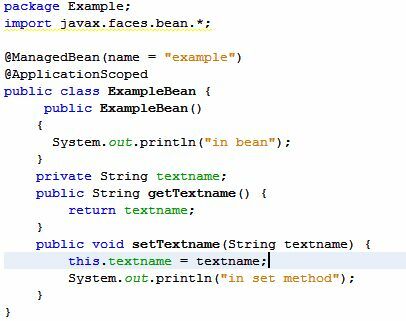 A Java class named ExampleBean.java will act as a Managed Bean for this JSP page. 1. None Scope: A Managed Bean with this scope is not stored anywhere. It is created whenever it is needed. Let me show you this assigning of the Managed Bean of a None scope. Now when you run the index.xhtml file, enter the value into the TextBox and click on the submit button, you will find it in the Bean displayed multiple times in server output window. The reason for multiple occurrences in the Bean output is the none scope of the Managed Bean. The Managed Bean is initialized each time it is needed. 2. Request Scope: Under this scope, the Managed Bean value is stored and is available while the request is alive. Now when you run the index.xhtml file, enter the value into the TextBox and click on the submit button, you will find in the Bean displayed in the server output window and the output.xhtml file displayed in the browser. Now if I return to the index.xhtml file using the browser's back button and again enter the value into the TextBox and click on the submit button then one more Managed Bean object will be created. So each time a request is sent to a Managed Bean, a new object will be created and saved under request scope. 3. Session Scope: Under this scope, the Managed Bean object is saved and is available for use in the entire session. All the requests within the same session share one instance of the Managed Bean. Now when you run the index.xhtml file the Bean class object will be created once and saved for the entire session. Now if you try and send multiple requests by going to index.xhtml and enter the value and click the submit button, the Bean class object won't be created. There will be output from the setter method only. 4. 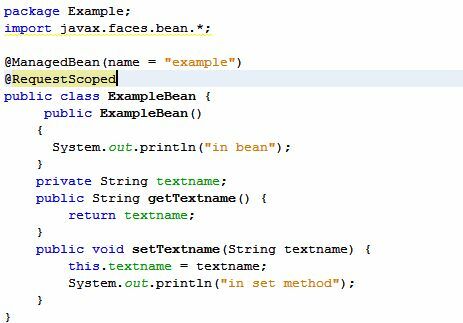 Application Scope: Under this scope, the Managed Bean object is saved and is available for use in the entire application for all the sessions and requests. A Bean is given application scope only if we want one instance of the Bean to be shared in the application. Now when you run the index.xhtml file the Bean class object will be created once and saved for the entire application. View Scope: A Bean remains in view scope while the same JSF page is redisplayed. As soon as the user navigates to a different page, the Bean goes out of scope. Custom Scope: In this scope, we make an entry of our Bean to a custom map and assign that map a scope (normally a Session Scope). A Bean lives as long as the scope of the custom map lives. I hope this article was useful to you. Thank you for reading it.